"Pitched at right physical demand and carried out in a very amiable/agreeable atmosphere." Our Phase IV Cardiac Rehabilitation classes are for people who are either recovering from heart problems or heart surgery. We offer safe and effective exercise under the guidance of a qualified B.A.C.R exercise professional (British Association of Cardiac Rehabilitation) to help with your long term maintenance of physical activity or lifestyle change. You can join at any time as our classes run throughout the year, but a medical referral is always required. Following completion of the NHS Phase III Cardiac Rehabilitation programme, you can be referred to continue into our Phase IV programme. This is a weekly, circuit-style class that is not held in a gym, and which you can continue to attend for as long as you wish. "Thank you for providing the above service. It is exactly what we need"
Unlike other Phase IV classes, ours is not held in a gym. You will be exercising with a small group of people who have all experienced similar health problems. 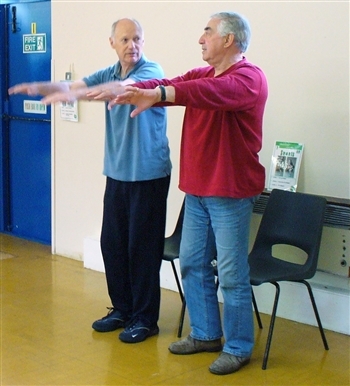 At your first session, the instructor will assess your medical condition and will agree an individual exercise plan with you, taking into account the medical referral form that you bring from your Phase III programme or your referral from your GP. At each subsequent session, the instructor will monitor your progress and modify your exercise plan to reflect your improvements. During the class you will move around a circuit in the room, performing different exercises and using different items of equipment as you go. Each session lasts 1.5 hours, and includes warm up and cool down exercises and stretches as well as the circuits. You do not need to bring any equipment with you. We recommend that you wear exercise clothing shorts or track suit bottoms and a tee shirt are fine, and you should also wear trainers. Bring water to drink, and you may want to bring a small towel - be prepared to get hot and sweaty! "No improvement necessary. I am happy with the activity provided. From my point of view, everything is very good."